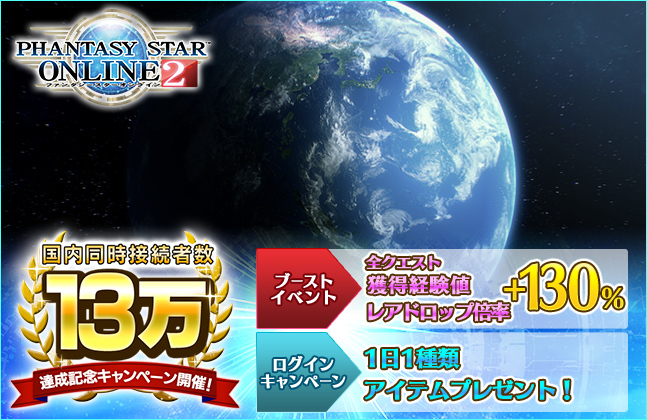 New Star Gem content is on the way after today’s maintenance, including the Treasure Shop and [Darkness Ruler] SG Scratch. PSO2 The Animation Vol. 4 releases on Blu-ray and DVD June 15th! Guides for the 4th Anniversary Bingo and Xie’s client orders can be found in the previous maintenance post. 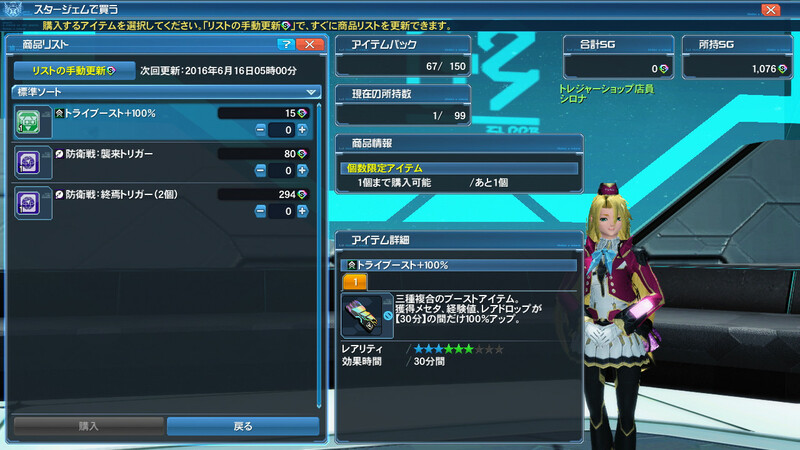 You can now obtain Dark Falz Costumes, Accessories, or Voice Tickets from the Star Gem Scratch! Items within this scratch can not be traded or listed in My Shop. You can obtain Quest Triggers from the Treasure Shop! Using this item allows you to play an Emergency Quest at your leisure. If the Quest Trigger owner disconnects or cancels the quest, all players within that room will be ejected from the quest. The Treasure Shop allows players to purchase items with two currencies, “Star Gems and Meseta.” Items such as Emergency Quest triggers and the All Candy Remover can be purchased with Star Gems. 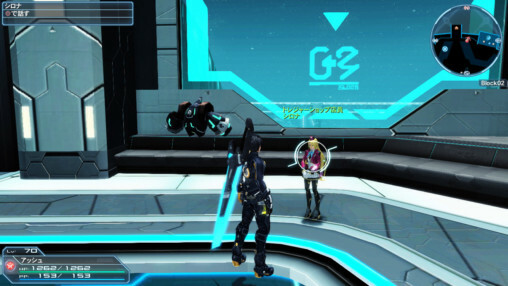 On the other hand, EXCubes, Pyroxene Stones, Stamina Drinks, and even the Gold Tokyo Bonus Key can be yours by paying an exorbitant amount of meseta. The items available in the shop will shuffle everyday at the time listed at the top of the window. However, you can optionally force the product listing to shuffle by paying Star Gems. Sega is celebrating achieving 130,000 nationwide concurrent connections in PSO2 with a memorial campaign! For more information, see our previous post about it. Doesn’t happen every time, just occasionally I’ll get fierce ping, everything stops – or I just get disconnected without any warning. I had this happen to me during yesterday’s Yamato EQ, so you’re not alone. Didn’t have this problem. But EQ are massive-populated at the same time so maybe it can explain. It have been a little laggy here some hours ago but I can’t be sure it wasn’t my PC anyway. It doesn’t -seem- like it’s directly related to population – because everything will work fine, until suddenly disco (or lag oblivion – when you’re connected but you can’t deal damage to enemies etc) – no slowdown or struggle – just BAM! Can someone help me? Prior to todays maintenance I haven’t been able to connect to any ships. I would log in and all the ships are offline apparently. When I try to join one it gives me error 240. Everything is up to date, idk what to do from here. Are you connected to a proxy when you play the game ? How can I check if I am? And/or what is the proxy I should be connecting to? Say, pals, is your connexion good these times? Servers seems slow and laggy since last mantenance here. It never happened so much since months so don’t know if it’s my connexion or servers. I haven’t done a mission as of late so I can’t say for sure. However, do no forget that we are trying to connect to Japan so expect some lag. Not going to lie. But I would love to see a update list on all the triggers since I’m not playing on PC.